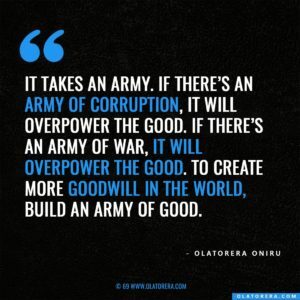 Corruption is a major problem that hinders Africa from developing into a developed continent, and this menace act is growing deeper within institutions of many African countries. According to the Oxford dictionary, corruption is defined as dishonest or fraudulent conduct by those in power, typically involving bribery or the process by which a word or expression is changed from its original state to one regarded as erroneous or debased. Africa must find a lasting solution to this menace if continent leaders and citizens want progress because without a political will from the population, this menace called corruption will not vanish overnight. Africa needs policies that will punish corrupt officials to serve as lessons to those thinking of venturing into corrupt acts. China will be a great example of a country where anti-corruption policies have worked to progress the country. At The 31st Ordinary Session of the Assembly of Heads of State and Government of the African Union (AU) taking place from 25th June to 2nd July 2018, under the theme “Winning the Fight against Corruption: A Sustainable Path to Africa’s Transformation”. The theme of the summit leader and the AU anti-corruption champion, Nigerian President Muhamadu Buhari calls on nations where looted assets have been stashed to release them without the usual long technicalities involved in the process of repatriation. Africa needs to rise from its slumber under the menacing grip of corruption. Olatorera Consultancy Limited provides critical business development and analytical services to companies looking to grow, enter or do business in Africa.